Representatives from political parties slammed the coup-sponsored 2017 charter on Monday, branded “Section 44” of being another form of coup and suggested the constitution should be amended after the House of Representatives is in place. The Criminal Court has scheduled an extradition hearing on Tuesday for a former member of the Bahrain national football team, now wanted political crimes. As resentments among political parties and politicians grow against the new poll ballot design, a former election commissioner has warned the Election Commission that the forthcoming election could end up being declared null and void. A government spokesman on Friday hit back at a Swiss bank report claiming Thailand has the world’s most unequal distribution of wealth. Salary increases in Asia-Pacific recorded a modest rebound this year for the first time since 2014, according to Willis Towers Watson, a global risk management, brokerage and advisory company. The rich and the powerful will continue to rule Thailand and Gen Prayut Chan-o-cha will be the next prime minister, as the regime plans, but will come under pressure, social critic Thirayuth Boonmee forewarned on Monday. The Election Commission (EC) is expected to decide next week on the format of the ballot paper for the upcoming general election. Thailand on Monday requested World Trade Organization dispute consultations with Turkey to address a rebalancing duty Ankara imposed on Thai air conditioner imports last year — a case with significance for the U.S., which is also facing safeguard rebalancing tariffs imposed several countries. FORMER student activist and renowned scholar Thirayuth Boonmee has predicted that though junta leader General Prayut Chan-o-cha will be able to form the next government, it will lack legitimacy and this will only lead to instability. Thailand’s roads remain among the deadliest in the world, but the Kingdom has dropped from its previous No-2 position to eighth, behind a collection of smaller African states and other undeveloped countries. The Industry Ministry will make a proposal to the mobile cabinet today to acknowledge and approve a biochemical hub for Udon Thani province, part of efforts to raise crop prices. The Revenue Department claims that only purchases of certain products are tax deductible under the “Shop for the Nation” campaign. THAILAND’S gross domestic product (GDP) will grow by 4 per cent and above next year, according to economic experts from Siam Commercial Bank (SCB) and Kasikornbank. Thailand’s car market in 2019 will exceed 1 million units sold but with much lower growth than in 2018, say auto experts who view market sentiment as sustainable and healthy. An Iranian man has been arrested after using travel freebies to lure an unsuspecting Japanese tourist into smuggling a bag of clothes laced with crystal meth, Thai police said Monday (Dec 10). HM King Maha Vajiralongkorn has graciously presided over the opening ceremony of the Bike Un Ai Rak event in Bangkok on Sunday. WE CAN NOW start counting down – with more confidence – to the national elections after the junta confirmed on Friday that the poll will definitely be held on February 24. The new law on MP elections also comes into effect today. Preserved Food Specialty Co, the maker of Coffee Dreamy non-dairy creamer, plans to ask the Board of Investment for promotional privileges to expand production capacity at PFS’s factory in Samut Sakhon. Thailand’s biggest political party, hit by defections ahead of an election that will allow the kingdom to emerge from military rule, remains confident of its chances even as a new polling system threatens to confuse longtime supporters. Parts of Nakhon Si Thammarat and areas in other southern provinces have been inundated after heavy rains that are forecast to continue this week. Nationwide house prices rose by 5.13% during the year to Q3 2018, in contrast to a y-o-y decline of 0.62% in the previous year. House prices increased 1.09% q-o-q in Q3 2018. Deputy Prime Minister Wissanu Krea-ngam has acknowledged a plan to rehabilitate digital TV operators. Proceeds of an auction of 700 MHz frequency will be spent on compensating MUX operators. Investigation into the luxurious wristwatches worn by Deputy Prime Minister Gen Prawit Wongsuwan is expected to be concluded by the end of this month. While Thailand is one of the most enthusiastic users of technology, especially social media, much of its most-used software is foreign-made. Maejo University is celebrating its 85th anniversary by hosting one of Thailand’s biggest agricultural fairs featuring exhibitions and recreational activities. The Thai government should ensure that recently arrested Pakistani asylum seekers are not returned to face persecution, torture, or other serious abuse in Pakistan, Human Rights Watch said in a letter to Thai Prime Minister General Prayut Chan-ocha on 5 November 2018. A severely underweight elephant has been filmed performing tricks inside a virtually empty zoo. Udon Thani province has been urging farmers to grow chemical-free, organic crops to help grow their businesses. The government has announced that donations to political parties are now tax deductible to encourage people to support the role of political parties. A leading facility services company says it will shut down operations in Thailand and 12 other countries as it tries to boost growth and simplify its business. A recent report revealed that the government of Thailand has passed a bill that it hopes will ensure more effective tax collection, especially from e-commerce businesses. Deputy Prime Minister Wissanu Krea-ngam has acknowledged a plan to rehabilitate digital TV operators. Hong Kong entrepreneur Kishore Samtani hosted a reception banquet and five-day destination wedding celebration for more than 1,300 guests at his son’s wedding at Splash Beach Resort, Mai Khao Phuket last week. The Department of Industrial Promotion (DIP) wants over 10,000 small and medium-sized enterprises (SMEs) and startups to operate their businesses online in 2019. Dragon City, the largest wholesale and retail trading centre in Bahrain, said it has signed a corporate agreement with Vega Intertrade and Exhibitions, one of the most sought-after exhibition and event organizers specialized in the Middle East and North Africa (Mena) region, to lease and operate ThaiMart, a Thai-themed retail development in the master-planned project. =Thai police have arrested seven Chinese who were allegedly hired to take ACT (American College Testing) exams on behalf of other test-takers who wanted good results in order to apply to study in the United States, Immigration Police Bureau chief Pol Lt-Gen Surachate Hakparn told a press conference on Monday. A paddleboard and windsurfer manufacturer is on a mission to reclaim its emissions by adopting circular economy principles and reforesting a nature reserve in Myanmar. Thailand’s mutual fund industry assets rebounded 3.63% in November, erasing the prior month’s loss, partly due to the recovery of equity and infrastructure funds, according to latest data from the Association of Investment Management Companies (AIMC). The Department of Internal Trade (DIT) has lauded the government’s welfare card scheme as not only beneficial to low-income earners but to retailers and the economy in general. The Bank for Agriculture and Agricultural Cooperatives (BAAC) has won AAA (THA) rating for its high capability of managing on-time loan repayments. Two workers died while three became seriously ill after allegedly inhaling toxic fumes as they cleaned a boat restaurant’s engine room on Sunday. Seventeen of the 129 criminals from the southern Thailand province of Narathiwat reportedly hiding in Malaysia are wanted by the Thai authorities for security-related offences, according to a high-ranking Thai source. The head of the Thai National Legislative Assembly (NLA), Pornpetch Wichitcholchai, has assured the public of the legislature’s commitment to following the rule of law. The Industrial Estate Authority of Thailand (IEAT) has opened its SMEs Industry Transformation Center (SMEs-ITC) at the Northern Region Industrial Estate in Lamphun. The Governor of Songkhla has instructed related agencies to monitor potential flooding from December 9th to 12th. The Finance Ministry plans to put the first 18 privately owned companies in which it owns less than a 50% stake on sale later this month. Showa Denko, along with its consolidated subsidiary Showa Aluminum Can (SAP), and Carabao Group (CBG), has completed the construction of new aluminum can factory in Thailand. Asia is one of the most important markets in the world and expanding a business here is without a doubt a great idea, no matter where you come from. 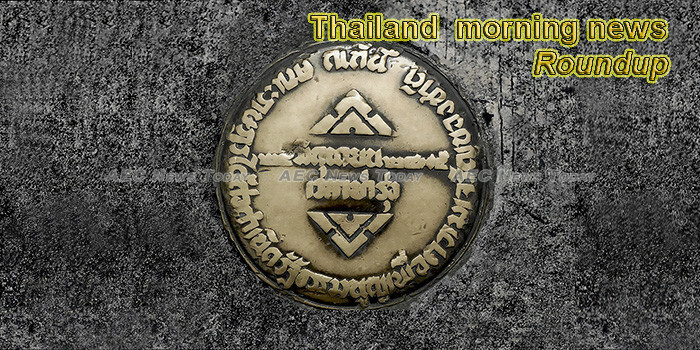 This week’s Thailand morning news feature photo acknowledges Thailand Constitution Day, December 10. Thailand morning news by AEC News Today is your one stop source for Thailand news on matters of governance and policies affecting Asean business communities. It is published M-F by AEC News Today: Governance, not government; policies not politics. John is an Australian national with more than 35 years experience as a journalist, photographer, videographer and copy editor. He has spent extensive periods of time working in Africa and throughout Southeast Asia. He has covered major world events including the 1991 pillage riots in Zaire, the 1994 Rwanda genocide, the 1999 East Timor independence unrest, the 2004 Asian tsunami, and the 2009, 2010 and 2014 Bangkok political protests. In 1995 he was a Walkley Award finalist, the highest awards in Australian journalism, for his coverage of the 1995 Zaire (now Democratic Republic of Congo) Ebola outbreak. Prior to AEC News Today he was the deputy editor and Thailand and Greater Mekong Sub-region editor for The Establishment Post, predecessor of Asean Today.